Ahhhhhhhhh, Microsoft. How you sometimes frustrate me for no apparent reason. Why you don't want the people uninstalling applications from the safe mode of your precious Windows operating systems is beyond me. After all, your good friends in Cupertino don't seem to think the same restrictions are necessary for Macs. But I digress. I'm not here to harp on the issue, but to give you, dear reader, a very viable workaround. Chances are if your Windows Laptop or Desktop PC is in need of some repair, uninstalling some of the software is necessary. And if you can't effectively work in Windows standard mode, Safe mode becomes your only route. Now there's a very circuitous method of enabling Windows Installer service you can take by editing the registry, but I'm not going to bore you with those details. Our good friends at Windows IT Pro have made a very useful, tiny app called SafeMSI. Download it HERE. 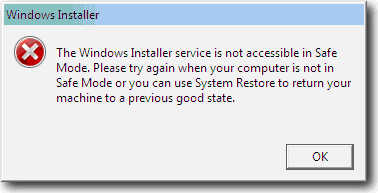 I've been successful with this on everything up to Windows 7, so if you need to run anything requiring the Windows Installer service in Safe Mode, this should be your ticket.